Father John was born and grew up in Richmond, Virginia to Ernest and Artemis Constantine. He graduated from Thomas Jefferson High School and the University of Richmond with a Bachelor of Science in Biology (1979) and a Master of Science degree in Biology (1981). After working as the Operations Manager for an environmental consulting firm, he entered Holy Cross School of Theology in Brookline, Massachusetts in the fall of 1983 and received his Master of Divinity (with distinction) in 1987. His first assignment after graduation from the Seminary was to Holy Trinity Cathedral in New Orleans where he served as the Lay Assistant for Youth Programs. While at New Orleans, he was accepted into the US Navy as a Chaplain Candidate Program and commissioned an Ensign in the US Naval Reserve on December 12, 1988. In 1989, he began his duties as an administrative assistant to His Excellency Metropolitan Silas of New Jersey at the Archdiocesan Headquarters in New York City. In June 1990 he began a series of Navy training assignments on board the USS LEXINGTON (AVT-16) at Pensacola, Florida, Marine Corps Base Camp Pendleton, California and the Naval Amphibious Base Coronado, California. In October 1991, he received the blessings of His Eminence Archbishop Iakovos and Metropolitan Silas to be ordained a celibate priest. On December 14, 1991 he was ordained Deacon at his home parish of Sts Constantine and Helen in Richmond, Virginia and on December 15, 1991 a Priest at St Elpis in Hopewell, Virginia by His Excellency Metropolitan Silas. Although ordained for service to the US Navy, Father John bowed to the needs of the Church and was assigned to St George in Piscataway, New Jersey in February 1992. While serving at St George, Fr. John was appointed a regional Youth Commissioner for the Diocese of New Jersey and sat on the spiritual court for the New Jersey state region. He was awarded the offikion of Oikonomos on November 14, 1992. In January 1995, Father John made his first pilgrimage to Jerusalem and the Holy Land and was privileged to take part in the midnight liturgy at the Tomb of the Lord. On July 23, 1995, His Excellency Metropolitan Silas elevated Fr. John to the ecclesiastical rank of Archimandrite prior to entering active service in the United States Navy. In August 1995, Lieutenant John E. Constantine, Chaplain Corps, United States Navy reported for duty at Naval Air Station, North Island in San Diego. He established a proactive flight line ministry to 14 helicopter squadrons, the Marine Corps Security Force Company and various other units at North Island. He celebrated the Divine Liturgy at Greek Orthodox Chapel of the Holy Cross on board US Marine Corps Recruit Depot, San Diego. For his efforts for the men and women of the Sea Services Fr John was awarded the Navy and Marine Corps Achievement Medal (1997) and the Navy and Marine Corps, Commendation Medal (1998). While in San Diego, Father John was welcomed with open arms at Saint Spyridon Church and assisted Fr John Kariotakis whenever available. In October 1998 following his active duty tour, he was assigned to Saint John the Baptist Church in Anaheim, California as Associate Priest by His Eminence Metropolitan Anthony of San Francisco. Father John was appointed Proistamenos of Saint George Church in Downey, California effective June 1, 2001. He arrived as the footings of the new Church building were literally being poured and has shepherded the congregation through the interior beautification of the Church to its sacred consecration in April 2010. Under his leadership, the parish been a visible and active among the Greek Orthodox Parishes of Southern California. In 2002, His Eminence Metropolitan Anthony of blessed memory appointed Father John as Vicar (Archieratikos Epitropos) of Southern California, thereby becoming his representative in this area and responsible for the area Spiritual Court. He was confirmed in that role by His Eminence Metropolitan Gerasimos upon his accession in 2005. In response to decisions of the President of the United States, Lieutenant Commander John Constantine, CHC, United States Navy, was recalled to active duty from January 2003 through October 2003. He was assigned to Marine Corps Base Camp Pendleton as Chaplain of the Mobilization Support Batallion. He was allowed to celebrate Sunday services at Downey while serving the rest of the week at the Marine Base. Father John was awarded his second Navy and Marine Corps Achievement Medal for his service. On January 1, 2010, LCDR John E. Constantine, CHC, USN retired after 21 years of Naval Reserve service. His medals and decorations include: Navy and Marine Corps Commendation Medal, Navy and Marine Corps Achievement Medal (with gold star), Meritorious Unit Commendation, National Defense Service Medal (with bronze star), Armed Services Reserve Medal (with Bronze ‘M’), Global War on Terror (GWOT) Service Medal. 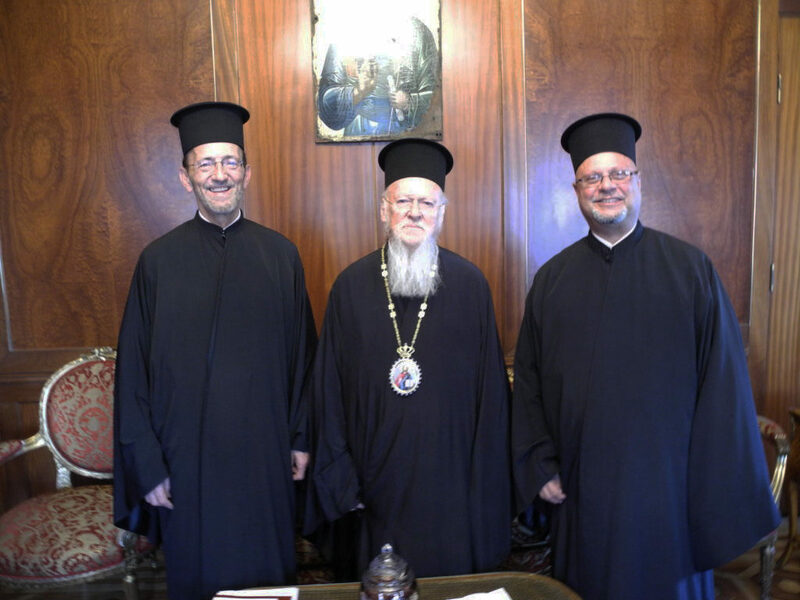 Metropolitan Gerasimos appointed Fr John as Chairman of the Metropolis Folk Dance Festival 2007 and Co-Chairman of FDF 2008 which were periods of transition for this important and vital ministry of the Metropolis. Father John functioned for many years as “Teletarchis” (Master of Liturgical Ceremonies) at the Folk Dance Festival and other services at which Metropolitan Gerasimos presides. Father John served as Teletarchis for the Consecration of the Monastery of the Living Spring in September 2010. From November 9 to December 8, 2010, Father John was invited to the Patriarchate of Constantinople as the first participant in a long awaited program in which the Archimandrites of the Archdiocese were to spend a month at the Patriarchate as guests of His All Holiness in order to become well acquainted with the institutions, and persons within the Patriarchate. This honor was even more special as Father John was asked to celebrate the Divine Liturgy at the Patriarchal Cathedral of Saint George and the Holy Trinity Chapel of the Halki Theological School. He was elected a member of the San Francisco Metropolis Council in 2012 and still serves on the Council. Father John holds US Navy Keel “C” Certification for sailing 27 foot sailboats and is a certified scuba diver having qualified as a PADI (Professional Association of Diving Instructors) Divemaster. He has accumulated over 290 dives in such locales as San Diego Coast, Catalina Island, Hawaii, Sea of Cortez in Baja California, Cozumel Mexico, French Polynesia, Tahiti, Honduras, Belize, Costa Rica, Florida Coast, Florida Keys, North Carolina and the Bahamas.